I'm waaay behind on my movie reviews - Mondays are just too busy most of the time! So, today's review goes back about a month or so to when my husband and I watched Cloud Atlas. We came into the movie from two different perspectives - I had read the novel it is based on and he hadn't - so we had two different reactions to the movie (probably the opposite of what you would think!). Let me start by explaining that I LOVED the novel Cloud Atlas by David Mitchell (review at the link - no spoilers). It was one of those books that just blew me away and immediately rose to my list of favorite books of all time. I couldn't wait to see this amazing book brought to life on the screen, but, as I said, my husband hasn't read it yet, so he went into the movie adaptation cold. This is a tough story to explain succinctly because it is actually a series of six stories, each set in a different time and place and featuring different characters. The stories, though, are linked in clever ways that aren't obvious at first, but as you watch (or read) you see these small connections. The stories begin in the 1800's and move forward in time to the 1990's and then onto a dystopian future filled with life-like robots and finally to a far distant future where technology is gone and humans - at least in this corner of the world - have reverted to a more primitive agrarian life. Each of the stories is engaging and interesting in itself - and each is very different from the others - but what I love most about this movie & novel is the way that it shows how everything and everyone is interconnected, even across centuries, and how one person's actions might affect someone else many years later and across the globe. I know that usually when you love a book, you aren't too thrilled with the movie adaptation, but I really enjoyed this one. They used some very clever devices to show that interconnectedness in the film that went beyond what you can do in a book. For instance, they used the same actors for completely different roles in each story. So, Tom Hanks and Halle Berry each play 6-7 different roles in this movie, as do the other supporting actors. Sometimes each one plays a lead role in a story and sometimes a very minor one, but these same faces keep showing up in different guises, which just emphasizes the story's theme of interconnectedness. I absolutely loved seeing my favorite book brought to life in this clever way and watched for the tiny details that connected the different stories, sometimes pausing the movie to point something out to my husband. Since each story is so completely different - one is an adventure on the seas, one is a mystery set in 1970's California, one is a romance, etc. - the movie includes pretty much everything - history, suspense, comedy (the story about Timothy Cavendish is very funny! ), romance, sci fi, and more. My husband found the movie somewhat confusing, which is completely understandable given its complexity. Translating a 500-page book to a 2-hour long movie is always challenging, and with a book that encapsulates 5 completely different but connected stories, it's almost impossible. It helps tremendously if you already know the plotlines and how they connect and you can just sit back and enjoy the spectacular production. So, my husband said he enjoyed it OK but didn't love it. Bottom line: If this sounds intriguing to you, I recommend you first read the book and then see the movie to see how it translates to the screen and to enjoy the clever ways they visually emphasized those connections between stories. I am very interested to hear what others thought of the movie - whether you read the book first or not. Leave your comments below! 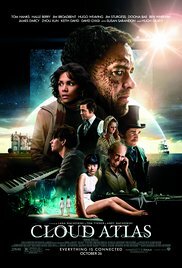 Cloud Atlas is currently available on Netflix streaming or to rent on Amazon for just 99 cents.